We’ve been working on tidying up the house: getting rid of stuff we aren’t using, organizing the things we have. This is why I’m conscious of having a small cabinet full of stationery and various containers full of pens. Knowing what you have makes it easier to not want more. I did order a bunch of Hi-Tec-C4 refills (blue and black from eBay, since that was cheaper). They’re marginally cheaper and less wasteful than buying new pens each time. I also stocked up on sketchbooks during a sale. I have some preferences when it comes to pens and paper. I like gel pens more than ballpoint pens because gel pens write more smoothly. I’m partial to fountain pens, but they can be picky about papers that won’t bleed through or feather. I prefer paper without rules, or with a very faint dot grid. Someday it would be nice to find a highlighter+pen combo that I can use without smudging. But really, tools are nowhere near being my limiting factor for writing or drawing or anything else like that. Even time isn’t what’s keeping me from doing more. More likely suspects: Energy, attention, focus. Sometimes I don’t feel like writing or drawing. That’s okay. There are plenty of things to do during those times. If I do want to feel like writing or drawing, I can make sure I get plenty of sleep and good food, and then I can tease my brain with an interesting book or question or topic to explore. Once I get started, I’m off running. There’s a natural end to this writing or drawing time, too. This is also okay. The trick is to make the most of the time while it’s there. You can buy good enough tools so that you don’t break out of writing or drawing just because you’re frustrated with the tools you have. 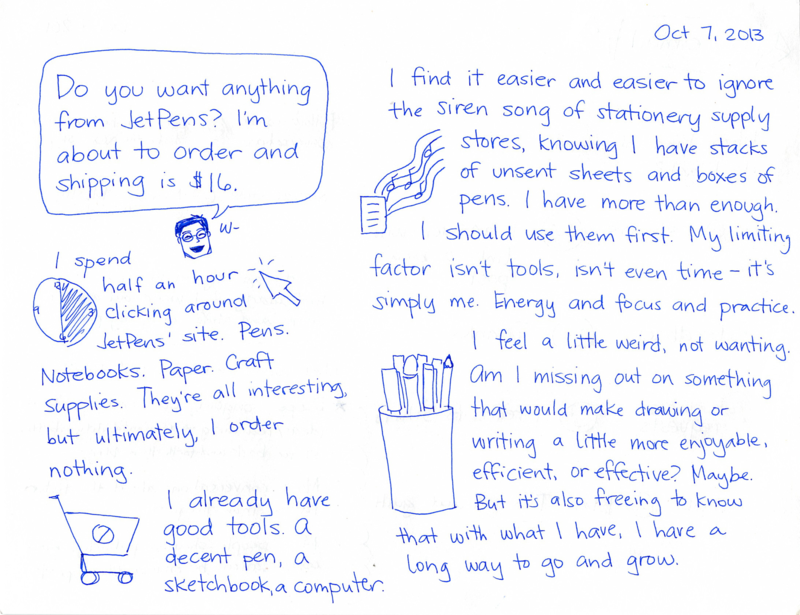 Going beyond that – trying to find the best pen or notebook or other gadget, or something that will turn writing or drawing into even more of a pleasure – is entirely optional. You can spend time on it, but don’t fool yourself into thinking it’s a necessity or use it to procrastinate actually doing things. Done well, writing or drawing is its own reward.